My research broaches the broad questions covering social and economic mobility, social inclusion, and quality of life and work for all. It examines the efficacy of social policies in providing counterweight to the forces which would lead down the track of high levels of inequality with all its damaging ramifications for society and for individuals. The paper I presented at the International Labour Organisation in Geneva July 2013 discusses how social policies linked to labour regulation deficits support casual and insecure jobs growth and poor labour market outcomes for disadvantaged workers. 1. The role of Australia’s employment services system in channelling unemployed and disadvantaged workers into low end jobs. 2. The effect of poor social capital on educational outcomes. 3. The brutally low Newstart unemployment payments and the effects on single parents now reliant on this payment. 4. Distressing reports from the USA on experiences and outcomes for unemployed people. 5. New evidence from longitudinal surveys of the high levels of entrapment in low end jobs. 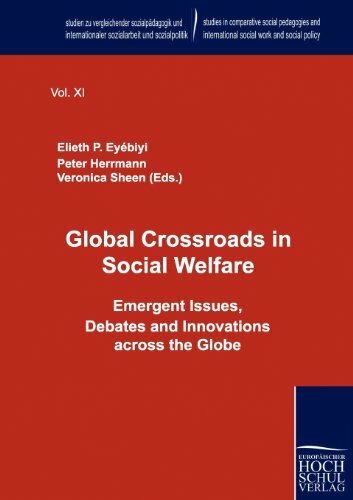 Following the International Council of Social Welfare conference in 2008, I worked with Professor Peter Herrmann and Dr, Elieth Eyebiyi to produce a book of readings on the challenges facing a range of countries around the world in achieving better social equity: Global Crossroads in Social Welfare: Emergent Issues, Debates and Innovations across the Globe.